Jason Houck is CIO of Hepta Control Systems and is in charge of the design and implementation of smart building networks. An experienced professional in the control systems integration and intelligent building industry, he has been an integral part of designing world-class systems that have earned international honors. These systems include a scope that ranges from systems design for new construction to integration of legacy equipment in landmark structures. Jason was honored as a “Young Gun” award-winner at the 2014 ControlTrends Awards and was named one of dBusiness Magazine’s “30 in Their Thirties” for 2015. Hepta Systems is an award-winning leader in integrated building automation and security controls. They provide single, driver-seat solutions for energy efficiency, security and tenant comfort systems efficiency in buildings. Scott Cochrane of Cochrane Supply & Engineering has the unique benefit of working with 300+ of the best systems integrators in the country. Cochrane recognizes the critical role they have within the building automation industry and is speaking with a different highly-regarded MSI each month with the goal of providing examples of industry trends, best business practices, and the growing value of an MSI. This month, he interviews Jason Houck from Hepta Control Systems. October Interview with Scott Cochrane & Brian Oswald, Managing Director for CBRE | ESI. 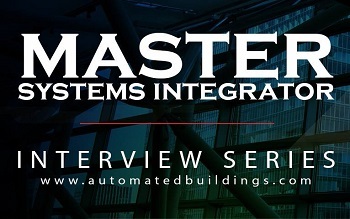 This month, he interviews Jason Houck from Hepta Control Systems. Houck: Becoming an MSI was not so much a conscious decision as a result of our process to continue to innovate in the intelligent buildings industry. We never sought out to offer services based on a pre-existing description of what a Master Systems Integrator should be able to do, so much as we tried to stay at the leading edge of the industry as a whole. For instance, we didn’t add an IT department and a software development department because they allow us to call ourselves an MSI. We added those departments because we found ourselves in a situation where the best way to remain a strong partner with our customers was to add services that competitors were still trying to avoid. We are constantly tweaking with our operations to make sure that our customers can rely not only on the work we do but on the projects we recommend. Houck: I don’t think there’s a dictionary definition, or accepted guideline of what an integrator should do, step-by-step to be considered an MSI. If there is a short answer it would be the strategic ability to offer open technologies, the technical knowledge to understand when “open” doesn’t truly mean open, and the relationship with the customer to explain the difference. For Hepta, some of the things that we feel set us apart are that we aren’t just willing to work with non-traditional stakeholders within our customer’s organizations, we seek them out to find out what we can do to serve groups that may otherwise be ignored. Having that in-house IT department helps us offer peace of mind in terms of network and cybersecurity. Beyond that, we try to keep a diverse staff whose strengths come together in really positive ways. Rather than a small group of “jack-of-all-trades” technicians, we have a big team with a wide range of specialties, whether it be graphic design, UI and workflow design, programming, installation or any of a number of other vital aspects of each project. Houck: While there are starting to be more and more advanced customers out there who already know the benefits of working with an MSI, we find that there is still a lot of work to be done in explaining the difference between integrators and MSIs. The earlier we can get involved in a project, the easier it can be to clearly show these benefits, through involvement in design and procurement. Our main priority in the MSI role is to serve the customer as an overall technology partner. Sometimes this means making unpopular recommendations like slowing a process down to make sure that stakeholders really understand the benefits of different technologies, or altering a scope and having it re-bid, but in the long run we feel like that kind of difficult conversations are something that set MSIs apart in the industry. Houck: In a lot of cases we will come in as a consultant to ownership to help guide projects through the lifecycle, but we also aren’t afraid to answer RFPs in cases where a customer has either together or with the help of an existing partner, written an MSI scope into their specification. Cochrane: Describe a challenge that you’ve encountered as an MSI. Houck: Throughout the industry, it’s become very popular and very easy to market a product or a solution as an “open” technology. Advertising an “open” API is not the same thing as offering one, which can lead to a lot of confusion for customers who may have already put in a lot of time and effort just to get to the stage of developing a strategy and a scope for an intelligent building. Likewise, there’s no certification process that anyone has to go to in order to tell a prospective customer that they are an MSI. There is a lot of noise to cut through in the industry right now, and we spend a lot of time doing everything we can to make sure our customers understand how to filter flash from substance. Buzzwords in this industry are plenty, and changing all the time, and in a lot of cases, the team with the best marketing wins by leveraging those buzzwords into solutions that only sniff the surface of what customers need. Houck: We plan always to offer the services our customers need to implement and maintain their projects and facilities. Right now, MSI services are the best way for us to do that, and we don’t envision a major change to that in the near future. That being said, our agility and willingness to take risks in the name of innovation are what’s made us an MSI in the first place, and that makes us confident that we can continue to grow and adapt with the technologies that make this such an exciting industry to be a part of.